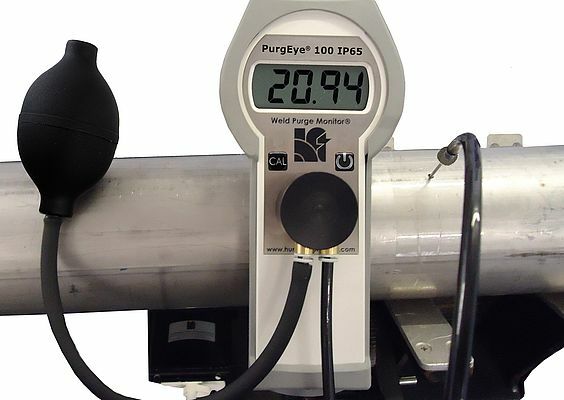 The low cost, hand held, battery operated PurgEye® 100, designed and developed by Huntingdon Fusion Techniques HFT® is perfect for welding stainless steel, reading accurately from atmospheric oxygen level (20.94%), right down to 100 parts per million (ppm) of oxygen. The PurgEye® 100 is IP65 rated and comes with leak-tight push buttons, auto calibration features, vacuum-sealed leak-tight probe assembly, wrist/neck strap and tripod mount. The extra long life sensor provides approximately 18 months life before it requires changing. A low sensor indicator will appear on the screen, warning that a new sensor is required. Once that icon appears, it provides the user with adequate time to obtain a new sensor, which can be fitted like changing a battery and the monitor can be re-calibrated easily by the user. With a clear, easy to read LCD screen, the PurgEye® 100 boasts a 24 mm high display with features such as a low battery icon as well as the low sensor icon. When the monitor is not in use, an automatic sleep mode activates to conserve battery life. 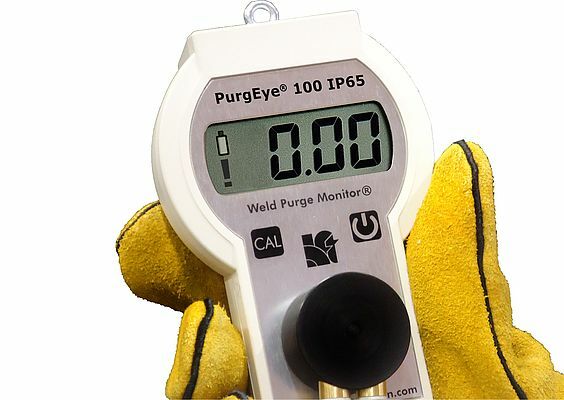 The Weld Purge Monitor® was invented by HFT® in the 1970’s and with over 40 years of innovation, design and manufacturing experience, the company now has a Family of PurgEye® Weld Purge Monitors® to measure oxygen levels from atmospheric content (20.94%) down to 1 ppm (accurate to 10 ppm).